Bob T Bear (esq. )'s Diary: Pant Emergencies, & Emergency Hug-Pants. Pant Emergencies, & Emergency Hug-Pants. The headline reads, "NZ Vicar in knickers-run rescue". It's about a town that ran out of pants. I am almost moved to start another campaign, this one to collect everyone's unwanted pants an send 'em to this town in New Zealand. ALMOST! But I'm afraid I don't have any spare. At my last count I had about 8 pairs of once-were-daddy's pants. Full ov holes, most ov them. But you can't just use pants for years an' years an' then throw them away. Where's your loyalty? No no no. Give your unwanted pants to your Bear. He'll appreciate them an give them a dam' good frolick. Small Bears, and not-a-bears, too, often have a pair of favourite "Emergency Hug-Pants". You may recall that I whip mine out if it thunders, as I don't like that. You remember Snoopy? Linus? His "security blanket"? -Emergency Hug-Pants. But they had to change it to "blanket" cos in Amerryka they say "pants" when we mean "trousers" HHHHAAAAAAAAAAAAAAAAAAA! I've just laughed myself into a painful stitch! Well, Audrey, pants are a bit like chocolate. It depends wot mood yor in. I'll say mor about dis in a blog, I think, as I could do wiv a long talk on pants. As could Wookey, I bet. Ack! We're sooooooo confused, still! We understand Bear English, since we're bears. (Our paws hit too many keys on the keyboard, so Mommy acts like our secretary and types what we say. 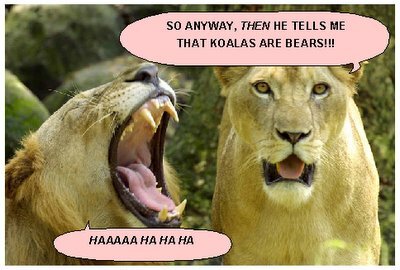 Since she is a People, she translates our Bear English, mostest of the time into Peoples' English.) 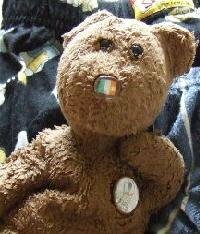 We don't know why you need to make all your posts into Peoples English, but, if you want to write to other bears in Bear English, you can visit one of our favoritestest message boards for Teddies, Tequila Teddy's message board -- http://groups.yahoo.com/group/TequilaTeddy . Mostest everyone types normally there. 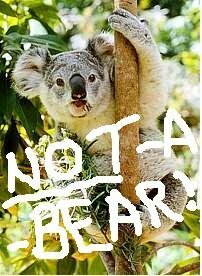 BUT, that's not why we are soooo confused -- Bear English we understand! British Bear English we have troubles with, at times! We're from Abearica, where pants mean trousers! We've read your explanations and your posts about your love of pants, and we think "pants" mean "blankets," but we're not sure?! First, you laugh at CSI's suspect losing his pants, but that is funny stuff, if you think pants are trousers, and not as funny if you think they are blankets. Second, you laugh at a story about wiminz, who cannot buy pants, even if you call them "knickers." Do you know that Abericans consider bloomers and knickers, another form of pants -- underpants!?!? And third, you said that you like to keep your Daddy's old pants, with holes in them, even if he has 8-9 of them. Well, if pants mean blankets, why does anyone need 8-9 of them, s'pecially holey ones?! In Abearica, guyz like to keep 8-9 pairs of holey underpants forever and ever, (guyz like to keep all old clothes, because that is when they are the mostest comfortable! )but not blankets!!!! And finally, we see you in a several pictures with cloth wrapped around you, telling us that you're with your pants, but the cloth is all squished up, comfortable-like, so we can't tell what they are. Ack!!! Now, we are beary proud of ourselves, because, when we looked at all your photos, we saw one of you in an "airing cupboard," and we knew that was a closet under, or near the stairs, where the heater is kept, because most homes in England don't have basements! Pretty smart for Abearican bears...but, we only knew that, because our wives and daughters, The Garden Gals, learned how to grow mangos from a British web site, and they s'plained it to us! Soooo, could you please s'plain to Abearican Bears what "pants" means again? We still don't understand!!! And, if you would help us understand "pants" in Abearica Bear English, if'n we ever write stuff that you don't understand, we can try to s'plain it in British Bear English. When we askeded Mommy to s'plain it to us, she quoted something that she is pretty sure was originally said by Wintston Churchill, "England and America are two countries divided by a common language." We never understood what that meant until now! HAAAAAAAAAAAAAAAA HA HA HA HA!!!!!!!! HAAAAAAAAAAA HA HA HA HA!!!!!!!! I do like to use daddy's old wuns as a blanket, though, an sum of them as a towel if I get wet in the rain. Yes, pants go round yer private bits. HAHAHAHA!!! Ladies' pants are sumtimes called KNICKERS. Sumtimes we call old ladies' big pants 'BLOOMERS' but only if we're being nasty. Also we have THONGS but I think Merrykan Bears call these 'strings' or 'G string's. I just call them nearly-pants. Duzz this make it eny clearer?